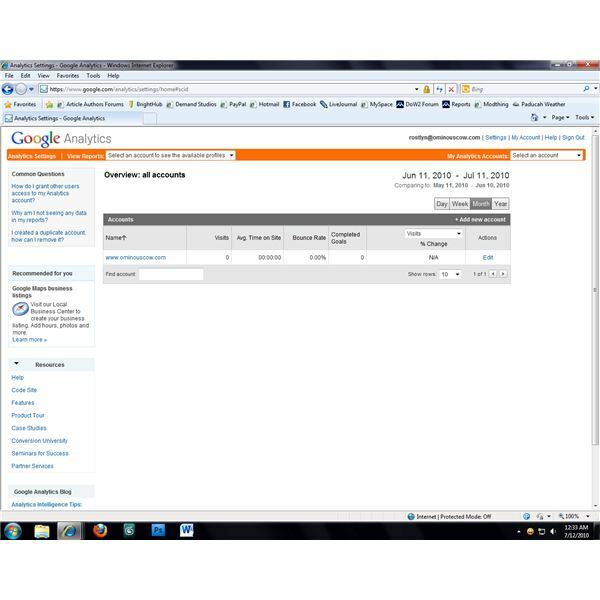 Google Analytics is a free website traffic monitoring service offered by Google. A snippet of code placed in the head of web pages being monitored by Analytics sends visitor info to Google so that the website owner using Analytics can see how many visitors the pages have had and where the traffic is coming from. Because it is a free service, some people expect there to be a sinister purpose behind Google Analytics; US Federal agencies being approved to use the service on their websites only strengthens the cries of conspiracy. The truth behind Google Analytics isn’t nearly as exciting as some of the theories, however. The code placed on web pages for Google Analytics produces a lot of data, especially for those users who advertise their websites with Google AdWords and have linked their AdWords and Analytics accounts. Analytics users can see how effective their advertising campaigns are by viewing how much traffic comes from their AdWords ads, and can also see traffic from free sources such as search engines and external links. Search engine optimisation (SEO) keywords and phrases can also be tracked, as can peak traffic times and the most popular pages on the website. This information can be used to both improve the site’s content and to target advertising at specific audiences based on what they’re searching for that leads them to the site. Google uses data collected by Google Analytics as well, though they only use data from Analytics accounts that have opted to share the collected data with Google. The data is used by Google to refine products such as new Google AdWords features and industry benchmarking services. Users who opt to share their data with Google will also receive early invites to use these products as they become available to the public. Another theory concerning the inappropriate use of Google Analytics data is that Google is using Analytics to track advertising traffic and SEO practices of businesses so that Google will be able to expand into other business sectors with an advantage over their competition. Though Google has branched out from simply being a search engine to having a presence in email, operating systems, and even mobile devices, there have been no indications that there are plans for Google to begin expanding its business into unrelated markets. Further, those businesses who do not wish to share data with Google can simply opt out of data sharing and Google would have no way to track advertising or SEO. Yet another theory stems from the use of Google Analytics by US Federal agencies, causing some people to theorize that Google is sharing traffic data with the US government so that the government will be able to better track the Internet usage of individuals. This is untrue, of course, as Analytics data isn’t shared with any third party; the only ones who have access to the data are the individuals with Google Analytics accounts and Google itself.